I have a new youtube channel to share with you all!! I usually workout at home the two days my son is at daycare (while I am on maternity leave – this routine will change when I go back to work on those days). I have been trying to find short intense workouts to ensure I can get my workout in without having to stop for a screaming newborn! I was always skeptical of short intense workouts. I always thought they didn’t get the job done and you needed to workout for a long time to lose weight; however, this go round I am proving myself wrong! I have been able to lose weight at the same rate if not faster than I did after baby #1 – and I am working out fewer days a week. I have to admit my husband has been right – a short intense workout is just as effective! I now present to you a great workout duo that will give you the opportunity to get a good sweat in 20 minutes (go for the more challenging option)!! HASfit 20 minute workout to burn 350 calories! It was supposed to be a rainy day today. Woke up, sun is out! IT IS GOING TO BE A GREAT DAY. We have the doors open, listening to John Cougar Mellencamp, rolling around on the floor, playing with baby toys and taking in some fresh spring air! What relaxing things do you like to do with your kids and/ or family as the outside temperature starts to warm up? Last night we made a last minute executive decision to go to our local fave mexican joint – we are valued customers at this point thanks to their booths and loud music to drain out any potential meltdowns at the dinner table. After some delicious fajitas I decided to workout. I wasn’t sure if my stomach was going to make it through; I surprised myself. I was happy I got in a night sweat before heading to bed. My husband kindly gave our son a bath and I did a combination workout. Below are four videos, you can do them in any combination – each workout is approximately 30 minutes. I did #2 and #4 last night. Switch em up and you won’t get bored. There are so many different movements the routines go by so fast you will have no idea you’ve already blown through one of the workouts by the time it’s done! However, I do not take her post workout two scoops of protein powder in water recommendation. I am not a fan of protein powders, they are loaded with crap! If you want to make a shake (using egg whites ONLY powder) make sure it’s a meal replacement or a low-cal snack, you can quickly gain weight by having a protein packed drink after your workouts. 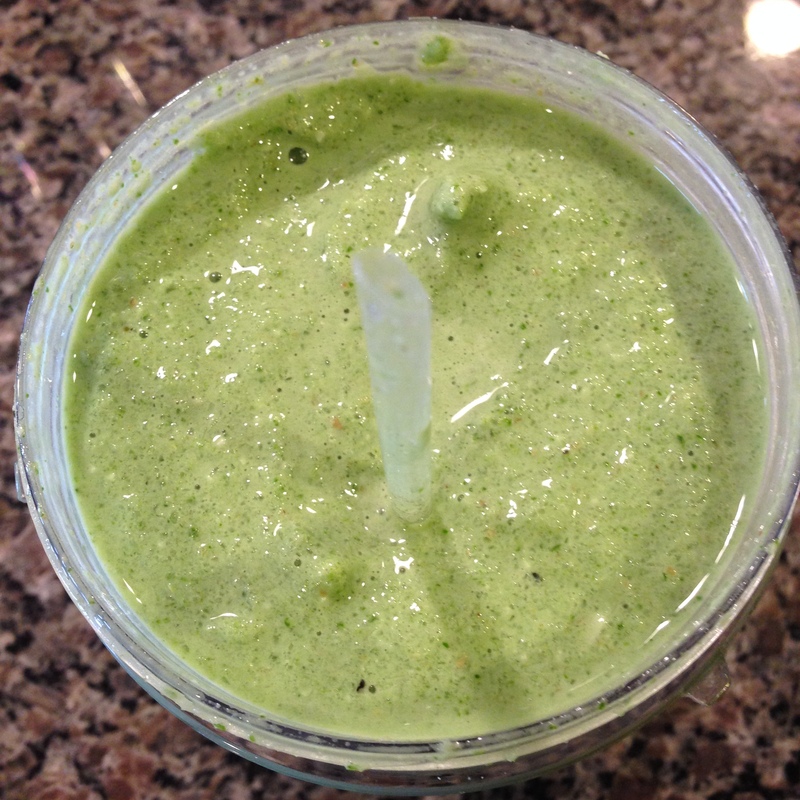 Here is a healthy green shake you could enjoy before or after a workout – I enjoyed this for lunch the other day, scrumptious! These recipes make two 16 ounce servings – I cut them in half. As you will notice the minimal amount of avocado makes a smoothie smooth, thick and creamy. It was shocking to see how just a tablespoon or two can take away the icey texture of a smoothie. 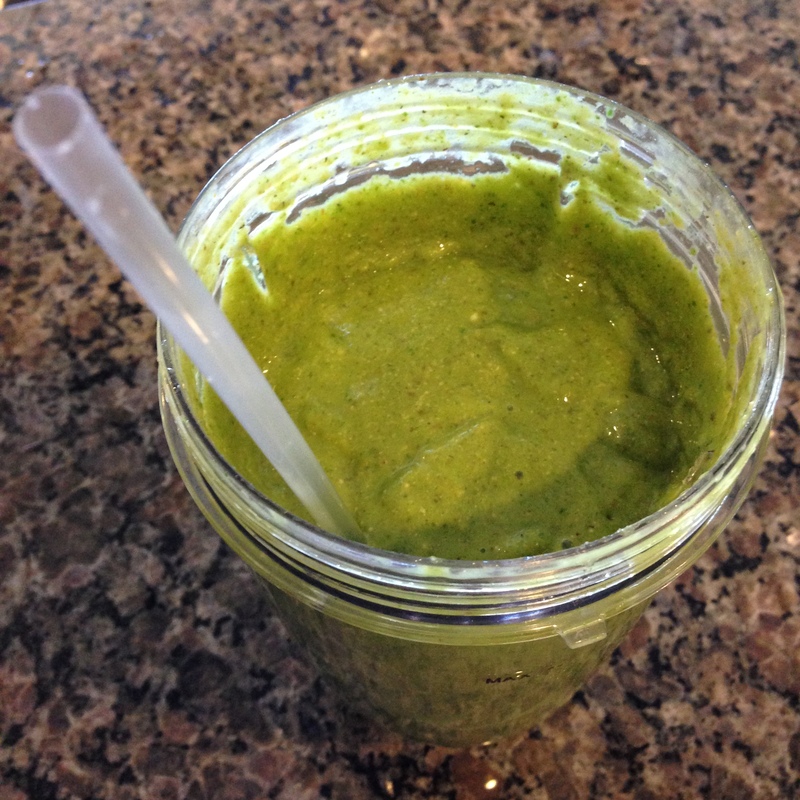 another green juice recipe (from her cookbook). NOM NOM NOMaste y’all! Happy Friday! Here are some quick workouts that will get your heart going and your glands sweating! Lately I have not been motivated to go to the gym, I have wanted to stay home and workout. Along with the rest of America, I view the gym as an oasis during the short cold winter days. When the sun stays out later I want to get my workout in quickly so I can relax outside after instead of driving there and back. I do miss sitting in the sauna…. tomorrow I will get there! Get ready to kill it with this heart pumping work-out! I did the video below for four rounds it was a great sweat. If you can add more reps, GO FOR IT!!! I could only do that many as the baby was only amused with me jumping around while he rolled around on the carpet for that amount of time. He even tried doing some “laying jacks” ! Rainy day here, probably will end up doing another work-out at home since we have family in town. It has been hard getting motivation to do home exercises, but once I am done… WOW I feel amazing! If you are procrastinating or have “time anxiety” and watch the clock until you know it is time to do your work-out, just let it all go and go do it. I sometimes find myself saying oh let me eat this and then digest and then I will work-out, but the reality is that I just want to be lazy right now! AND, that is perfectly FINE! No one says you have to work-out at a specific time. Go be lazy! Except, while you’re laying on the couch enjoying your down time don’t watch the clock and dwell on the dreaded workout that is yet to come. Just enjoy the moments and then pick yourself up and pump up your heart rate! With that being said I need to find a workout and take some of my own advice!! This past week I went to my first official CrossFit class (the reason I say the preceding is because my husband doesn’t count community classes as a “true” example of CrossFit), and, I went back to Barre class!! I have always been super intimidated by CrossFitters and “their classes.” However, I really enjoyed the routine. I did go to a class at a gym that is just starting, so it was a calm atmosphere and I received a lot of one on one attention to ensure my technique was on point. After I left I was sweaty and excited to return for another round. I can see how people get addicted to ONLY CrossFit classes – I wanted to go back and lift more the next day!! I don’t know how I will do when I’m thrown into a mix a larger gym. I will have to walk in without a guard up, and know that I’m just a work in progress and not the best (I am super competitive, and I don’t like not being able to life the prescribed amount of weight the first day walking into the class). Likewise, when I’m in barre class I also feel slightly intimidated by those who are ex-dancers and ballet stars, but going to these classes is good for me. Being uncomfortable and working through fears allows me to realize, as scary as it may be, I’m not perfect – no one is – and life is about making progress each day toward a goal. Like the old saying goes: “Rome wasn’t built in a day.” I also was able to get in one of these YouTube workouts (see below) and today I will be doing a stairs run. I’m hoping to keep up this routine of trying to get in a workout everyday, and taking a day of rest here an there. I don’t want to talk about weight loss specifics, but there definitely has been a faster drop as I have increased the amount and intensity of my workouts. For those of you trying to shed some pounds, get your heart rate up!!! And for those who are just looking to stay healthy, keep your heart rate up!!! Throughout my pregnancy I was able to maintain a low blood pressure and heart rate, which has definitely helped me get back to exercising without feeling like my head is going to explode and heart is going to bust out of my chest cavity. This morning I woke up and finished off a fresh batch of almond milk before going on a walk in this lovely 50-something degree weather!! When we get back I will begin making my weekly batch of energy ballz. Finally tried these Macadamia Chocolate Chip Cookies which I found posted on The Coconut Mama’s website, however, I believe they are a PaleOMG recipe. 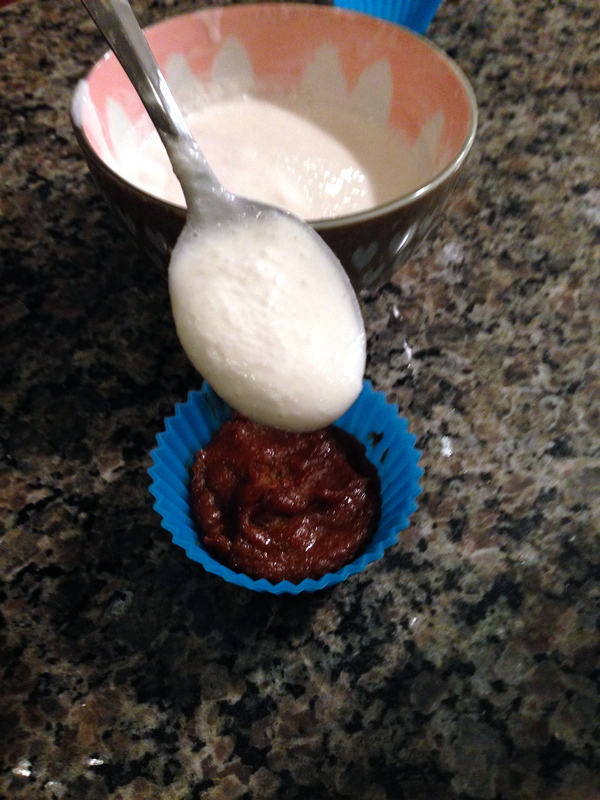 The batter was like a bowl of honey – I was not expecting that consistency!! 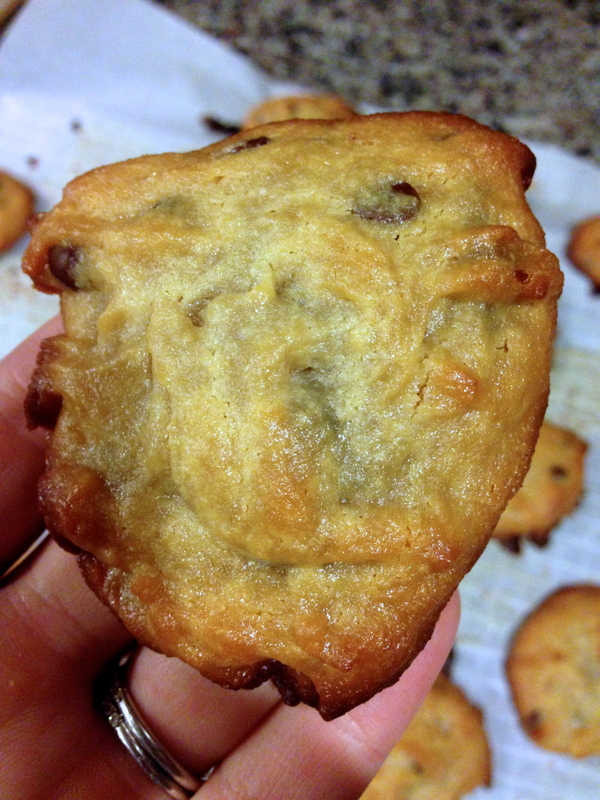 I was pleased with the “gooeyness” of the cookie – I do not like crunchy/hard cookies. 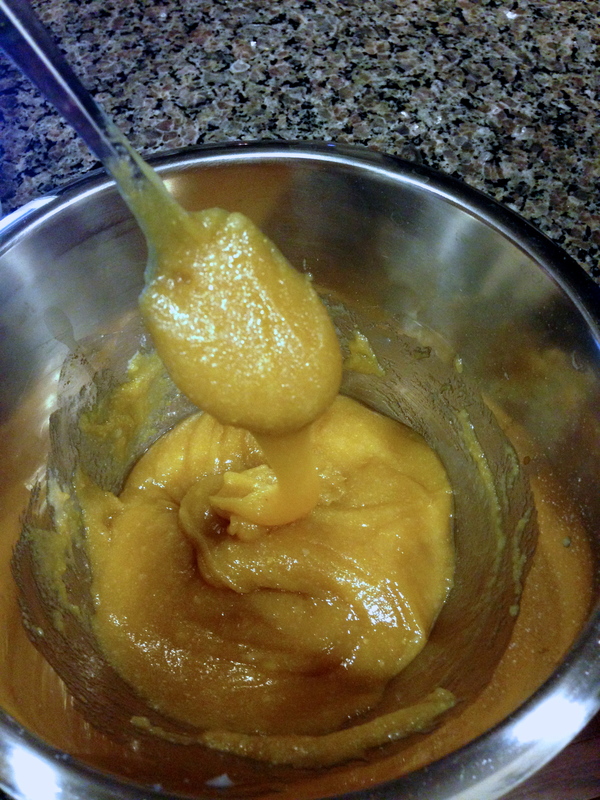 Essentially, my favorite part of baking is eating the batter. I hope you like macadamias if you are making these because these cookies taste like you are munching on some nuts. I was hoping for something a little sweeter, but my husband was clearly digging them – the batch lasted two days. **I used homemade macadamia nut butter, which is featured in my butter section under the vittles tab. Next up are paleo oreos!! Yummmm! I do have to admit mine do not look as beautiful as the ones on the website posted below – I don’t have that much patience at this stage to make perfect oreos when we are going to gobble them down. Now if they were for other people to enjoy maybe I would take more time to prepare them as eloquently as displayed on Will Bake For Books’ website. Please go make these treats and enjoy them as much as we did!! 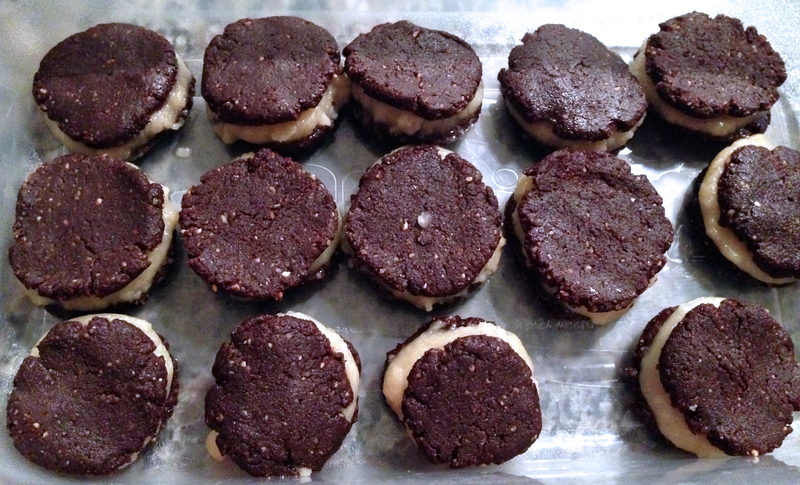 The only thing I changed in the Raw Oreos recipe is using 1/2 cup cocoa with 1/2 cup carob powder. I have been trying to use carob powder, I know it is supposed to be good for you, but I honestly have zero idea what it is. I am going to do some research for myself and my readers and get back to you with some mind blowing facts!! I will work on my presentation skills 😉 . 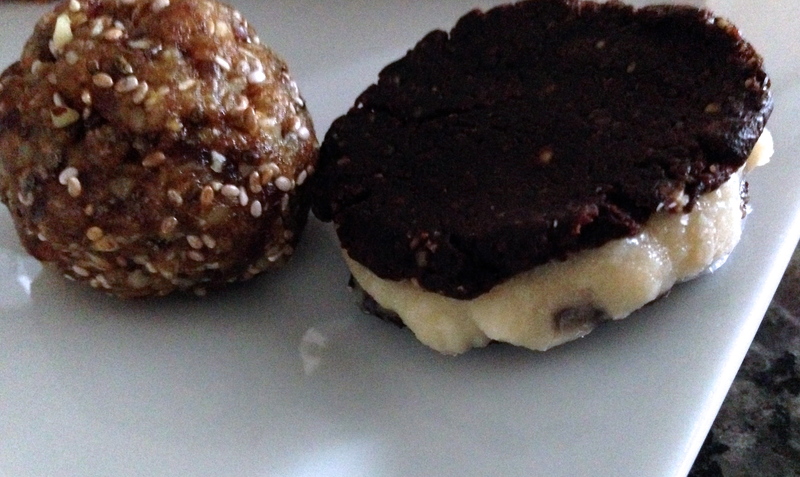 Paired with the oreo is an energy ball, I enjoyed both after eating a salad for lunch one fine day. And, to wrap up this wonderful dessert feast I have something festive for the holidays and winter hibernation months. Dig your teeth into these Paleo Pumpkin Pie Cupcakes for a light treat after dinner or a snack during the day. I apologize for my coconut whipped cream – I over whipped it and it lost it’s fluff. 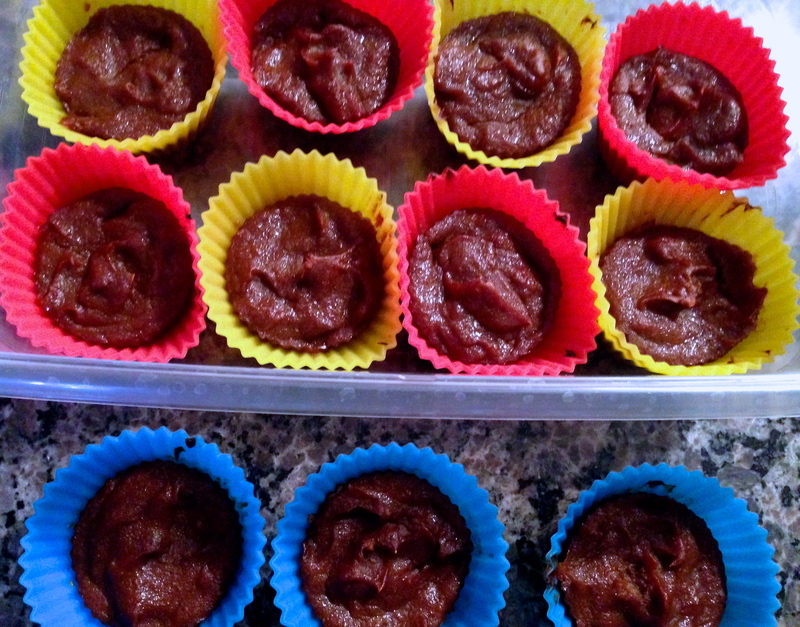 I didn’t get a good picture of the inside mushiness – they are like raw banana bread slices. The pumpkin taste is subtle, the spice flavors compliment the pumpkin & banana nicely. After indulging you might want to hit play on some of these videos!! I really liked this video – it was a solid workout of the whole body. The only part that was super challenging was the oblique exercises when you are laying sideways on one elbow and one knee – at this point i was like oh my gosh this is really challenging at that point of the workout!!! I pushed through – there are some words of encouragement during the video, which is helpful. I just listened to the music and made some grunting noises as if I was in a meathead gym. If you would like to keep it easy on your knees you can try this workout, which I also really enjoyed. If you look at the comments lots of people are skeptical of the low cardio workout, but they write they were sweating a lot and extremely tired at the end. I too thought this was going to be an “easy” day, however, my sweatshirt was nicely coated with sweat [sweat makes me extremely happy, I feel accomplished after a sweaty workout knowing my body is free of toxins].